This month's challenge for the Daring Bakers came from Morven at Food Art and Random Thoughts. 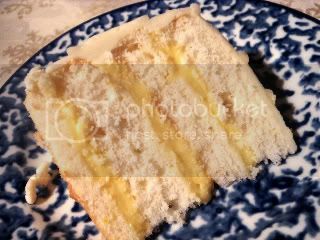 The recipe was Dorie Greenspan's Perfect Party Cake, the components being a very loverly white cake, your own choice of filling, and a lemon buttercream. 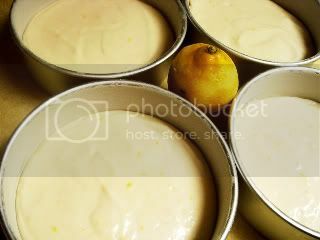 I chose to bake the cakes in four 6-inch pans instead of two 9-inch pans. What interested me most about this recipe was that the egg whites weren't beaten separately, but mixed with the liquid and added after the flour additions. 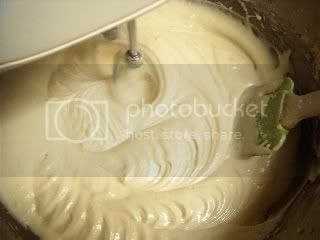 The batter was very good and voluminous. The height of the baked cakes pleased me. 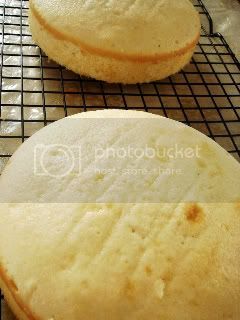 The sturdiness of the cooled cakes was great when it came time to slice each disc in half length-wise. 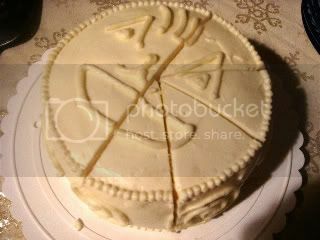 The slicing went along easily with minimal crumbling. 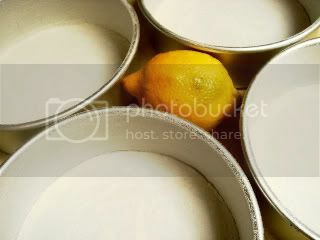 Since we were allowed to choose our own fillings, I picked a lemon pastry cream. The extra good part was that it used up most of the egg yolks left over from the cake and buttercream. Swiss Meringue Buttercream Round 2: Me, 1 out of 2 vs Buttercream, 1 out of 2. 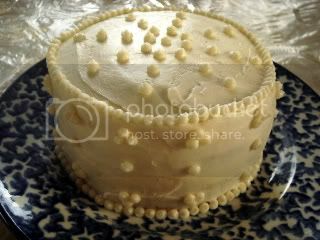 The first time I made a Swiss meringue buttercream I failed to beat the meringue mixture itself long enough and I didn't keep beating the buttercream after I added the butter, leaving it entirely too runny and curdled. It tasted great, but it made assembling the yule log (the Daring Bakers' December challenge) an epic pain. 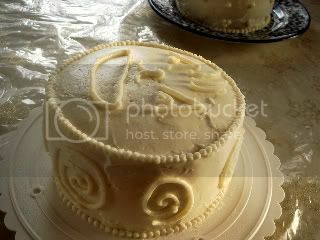 This time, I was armed with a decent amount of knowledge and was able to produce a silky-smooth buttercream that frosted wonderfully and was the perfect piping consistency. I did decrease the butter by one stick and it didn't negatively affect the outcome. 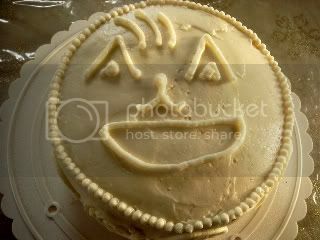 Don't forget to read the tales of my fellow Daring Bakers, so make sure you click the link on the sidebar. The following occurred on 25 December 2007. 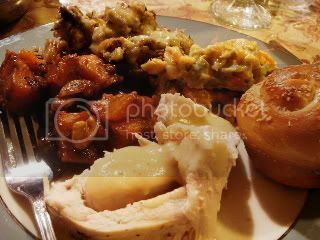 Christmas dinner in my family usually consists of the same foods. Why? They are familiar holiday foods that we only make on major holidays (Easter, Thanksgiving, and Christmas). It's what my family and I look forward to. We also tend to make the exact same comments about each dish, each year. "Candied sweet potatoes really are just a pie filling, sans crusts." Says my mom. "That's why it shouldn't be sweet. It should be savory." Replies my dad. These rolls were made from a different recipe, I think. Or perhaps not. I can't remember if I forgot to make them the night before and I made a regular recipe, or if I used the standard refrigerated-overnight recipe. Hm. This is one of my brother's favorite dish, green bean casserole. 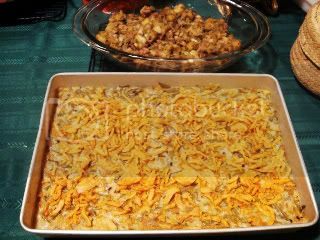 This is the aforementioned candied sweet potato casserole (recipe at end of post) with walnut topping. We usually make a traditional marshmallow topping, but we didn't have any marshmallows. That ended up being a good thing because we might not have tried this otherwise. The directions for the sweet potatoes is our recipe of choice, as it's simple, can be made on the stove, and can be made ahead of time. A huge bonus to speed up the cooking on that day. 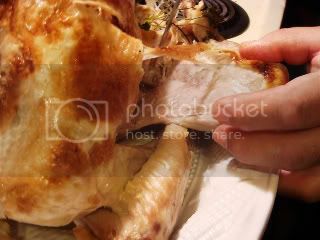 The turkey. 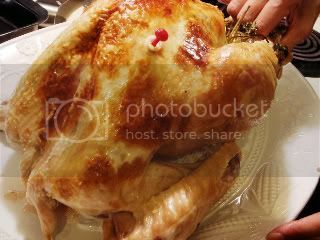 I know we cooked it in a turkey bag, but memory fails me as to what we cooked it in. I'm somewhat certain that it was in the oven instead of the turkey roaster this time. 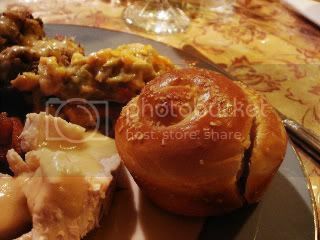 From top, clockwise, bread dressing (made with homemade bread), a bit of green bean casserole, a roll, turkey with homemade gravy, and candied sweet potatoes. Roll innards! Soft, fluffy, with a nice chewy crust and granules of kosher salt to add a burst of flavor. "The first time around, put about a tablespoon of whatever interests you on your plate. Doing so allows you to really figure out what you want instead of eating a double-portion of what you didn't really care for after all." For a more intense molasses flavor, us dark brown sugar (Me: we usually use dark brown sugar) in place of light brown sugar. To make ahead, follow the recipe through step 2. refrigerate the sweet potato mixture in a large microwave-safe bowl, tightly wrapped with plastic wrap, for up to 20 hours. 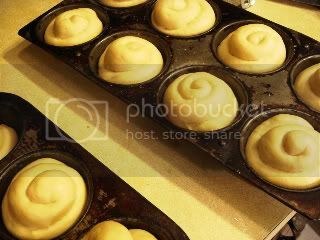 When ready to bake, poke several vent holes in the plastic wrap covering the potatoes and microwave on medium-high power until hot, 3 to 5 minutes. Continue to assemble and bake the casserole as directed in steps 3 and 4. 1. 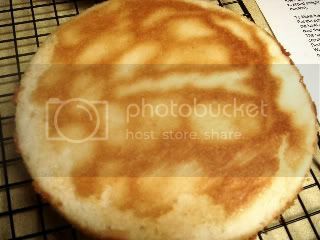 For the Sweet Potatoes: Melt the butter in a large Dutch oven (Me: we use a large, deep skillet) over medium-high heat. Add the sweet potatoes, brown sugar, salt, pepper, and water; bring to a simmer. Reduce the heat to medium-low, cover, and cook, stirring often, until the sweet potatoes are tender (a paring knife can be slipped into and out of the center of the potatoes with very little resistance), 45 to 60 minutes. 4. Adjust oven rack to the middle position and heat the oven to 450˚. Pour the potato mixture into a 13 by 9-inch baking dish (or shallow casserole dish of similar size). 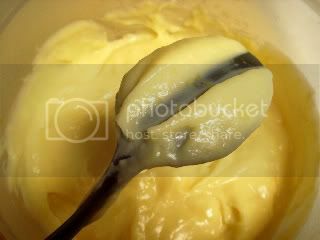 Spread the topping over the potatoes. 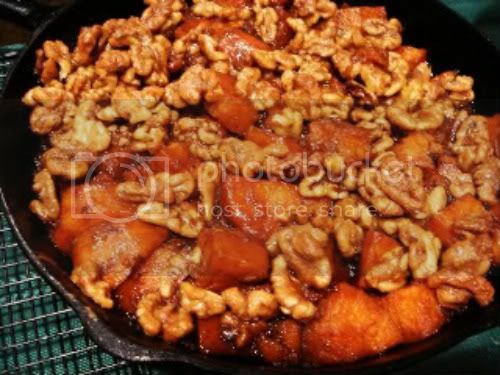 Bake until the pecans are toasted and crisp, 10 to 15 minutes. Serve immediately (Me: it can sit for a few minutes if you have any last-minute preparations for other stuff). In the book Once Upon a Tart Frank Mentesana mentions "eating from a memory". What that means (in my words) is that there are moments in your past where a certain food item stuck out to you. Not only was it solely because of what you ate, but also the moments leading up to, the moment of occurrence, and the moments immediately after; many mini-memories are often involved in that one event to create a whole. Mentesana goes on to say that when you try to recreate that moment by eating the food that you had back then, it's never quite the same and sometimes mars the pleasant memories associated with the past event. Sometimes, you are afraid to eat it again for fear it won't live up to how good you remember it being. Yesterday, that happened to me. Last year, I remember spending a few hours walking along the paths at the Indianapolis Museum of Art with my mom. Although I brought along a Clif Bar to tide me over, we both were pretty hungry afterwards and decided to see what they had at the museum's cafe. We noticed a basket of cookie with the word "Puck's" on the baggy and I knew I simply had to try them. The variety we bought included oatmeal-raisin, white chocolate-cherry-possibly macadamia, and peanut butter cookies. They were all stellar, but the peanut butter was pure gold. 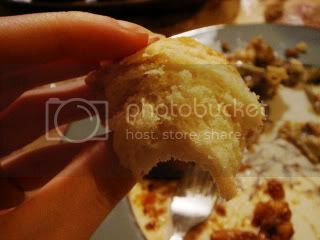 The texture was chewy, moist, and nowhere close to being overcooked and dry, it had a very deep peanut flavor, different than any I had tasted or made before, and was buttery without being greasy. It literally melted in my mouth. Sadly, it was before my blogging days so I didn't think to take a picture of it with the camera we had. 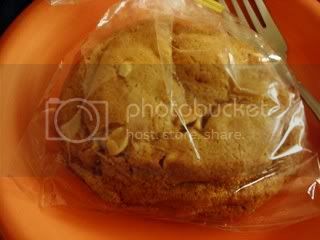 Fast-forward to the present, I was brought a peanut butter cookie from said museum's cafe by my mom. At first I was thrilled, then I looked at the cookie and knew something wasn't right. My mom did say that it wasn't the same as she remembered and deep down I knew it was true, though I still hung on to that memory of the past. This cookie's outtards looked different and there wasn't "Puck's" on the front. I may be wrong, but I thought there was a cross-hatch pattern on top and the surface had more of a crinkled look. There were whole peanuts in the old cookie, so that hadn't changed. One bite and I knew it wasn't the same. The peanuty depth was nonexistent, the innards were cakey and dry, and it was too thick. 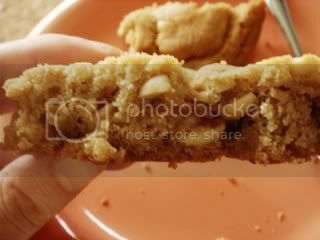 It lacked any buttery taste, the epitome of a well-made cookie. This was nothing but a typical run-of-the-mill cafe cookie that you eat not because it tastes good, but because you are desperate for something sweet. Here you see the innards. 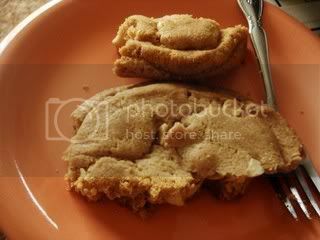 The original cookie was about half the height that this was. There you are, reliving my crushed memories with me. At least I have and had solace in company that has experienced the same feelings and disappointments that I have. What is one favorite foodie memory that stands out to you above all others?